› Author Affiliations Funding This project was supported by the Swiss National Science Foundation (grants #31003A-152633/I and #31003A_172864) and an unrestricted grant from the ISTH2007 Presidential Fund. Background Numerous mutations in FGA, FGB or FGG lead to congenital fibrinogen disorders (CFDs), but their epidemiology is not well characterized. 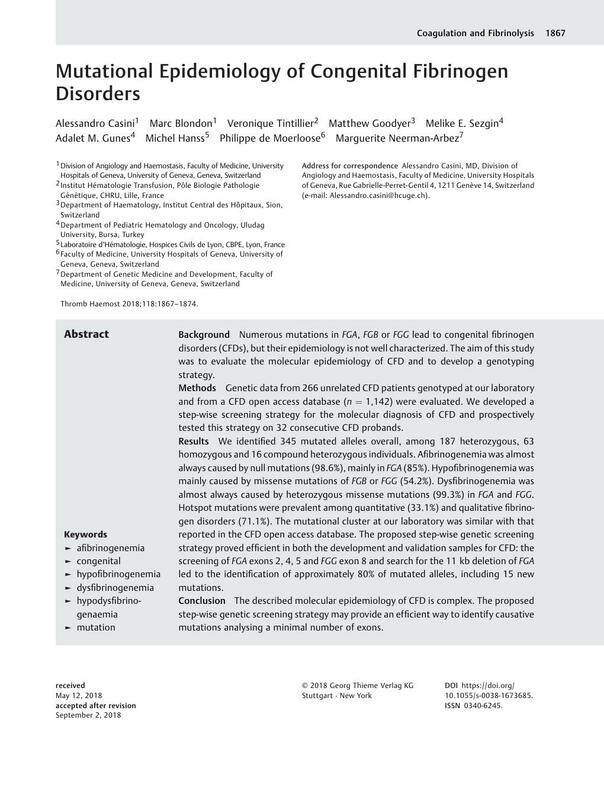 The aim of this study was to evaluate the molecular epidemiology of CFD and to develop a genotyping strategy. Methods Genetic data from 266 unrelated CFD patients genotyped at our laboratory and from a CFD open access database (n = 1,142) were evaluated. We developed a step-wise screening strategy for the molecular diagnosis of CFD and prospectively tested this strategy on 32 consecutive CFD probands. Results We identified 345 mutated alleles overall, among 187 heterozygous, 63 homozygous and 16 compound heterozygous individuals. Afibrinogenemia was almost always caused by null mutations (98.6%), mainly in FGA (85%). Hypofibrinogenemia was mainly caused by missense mutations of FGB or FGG (54.2%). Dysfibrinogenemia was almost always caused by heterozygous missense mutations (99.3%) in FGA and FGG. Hotspot mutations were prevalent among quantitative (33.1%) and qualitative fibrinogen disorders (71.1%). The mutational cluster at our laboratory was similar with that reported in the CFD open access database. The proposed step-wise genetic screening strategy proved efficient in both the development and validation samples for CFD: the screening of FGA exons 2, 4, 5 and FGG exon 8 and search for the 11 kb deletion of FGA led to the identification of approximately 80% of mutated alleles, including 15 new mutations. Conclusion The described molecular epidemiology of CFD is complex. The proposed step-wise genetic screening strategy may provide an efficient way to identify causative mutations analysing a minimal number of exons. A. Casini, P. de Moerloose and M. Neerman-Arbez designed the research and wrote the article; A. Casini and M. Blondon extracted and analysed the data; A. Casini and M. Neerman-Arbez performed genetic analyses; M. Hanss provided data from the Human Fibrinogen Database; and V. Tintillier, M. Goodyer, A. Meral and M. Evim provided genetic samples and patients information (more than two patients in the prospective part of the study). All authors provided critical revisions to the manuscript.